Day 6 already and it's violet day. 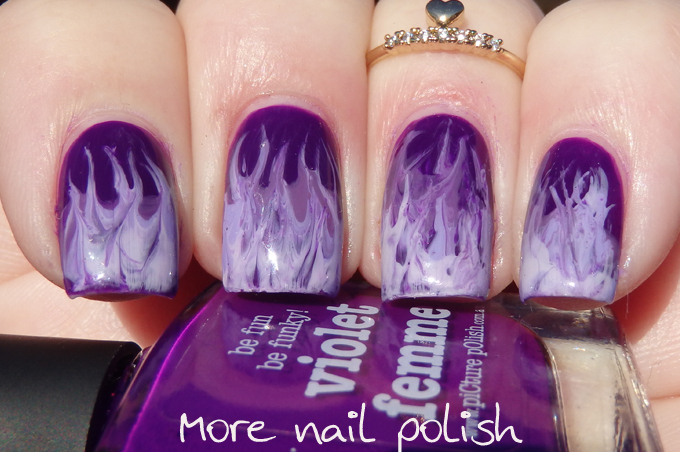 I started my violet nails with a gradient that used Picture Polish violet femme, wisteria and bright white, but I felt the darker purple was a bit too strong, so I also added in some Grace-full Grape, which gives the design a much dustier look. 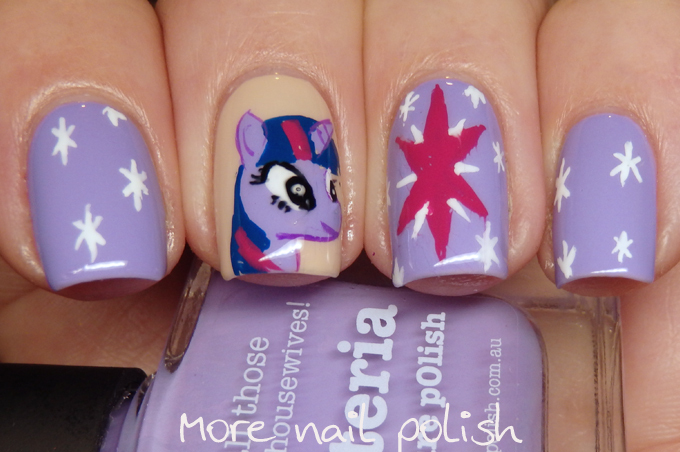 I then added a glittery top coat of Pretty Serious Daphne's Masquerade Party. 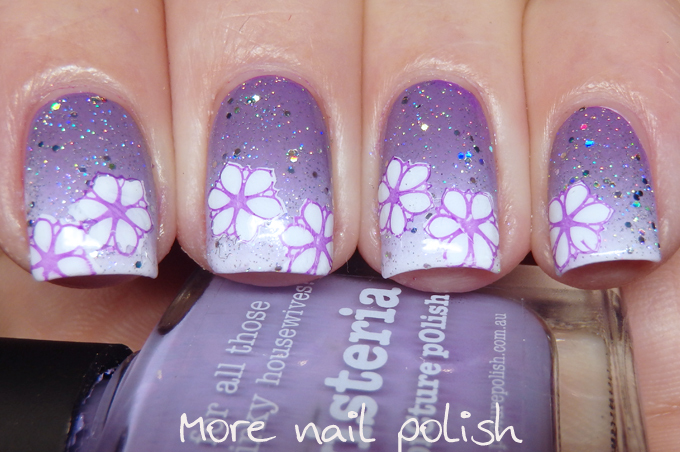 On top of that I did some layered stamping of white flowers with a purple outline. 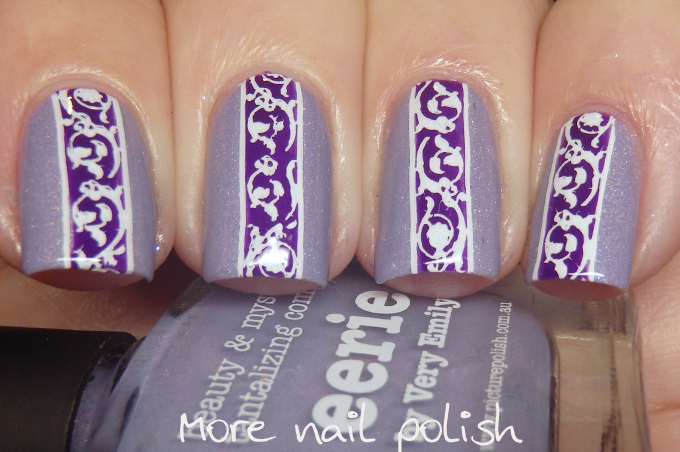 I didn't use a stamping polish, instead used Picture Polish violet femme, as I knew when it was a bit sheer on the white it would be an excellent match. 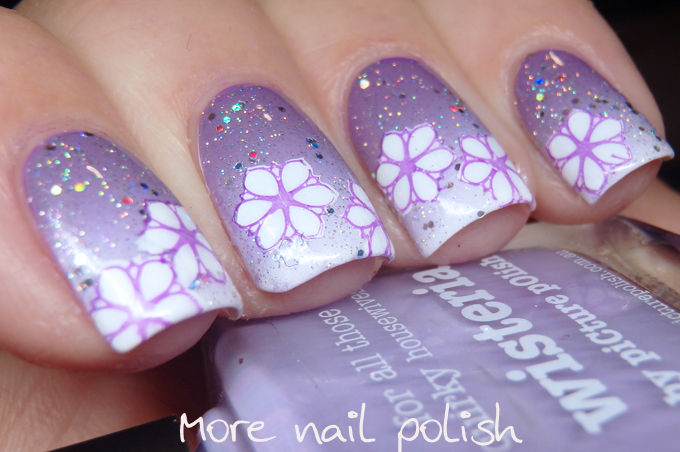 I was saying yesterday that blue day had a Picture Polish theme over the years, but it turns out that Violet day has even more of a Picture Polish theme, with me choosing Picture Polish shade every year for the last 5! 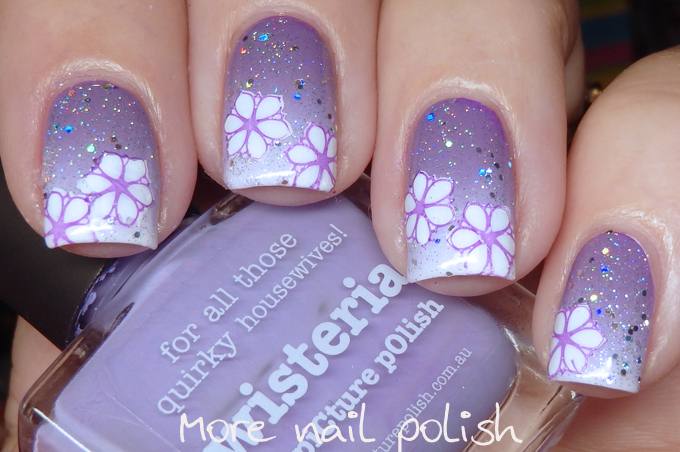 The layered flower stamping image was on a new plate that I received from DRK Nails. This is the first large KONAD plate I have. KONAD plates hold a special place in my heart cause they were the very first plates that I tried about 7 years ago. The plate is called square image plate 31 and just like my very original KONAD plates, these ones are excellent quality. There are lots of layered stamping designs on this plate to make blossom trees and other floral designs. 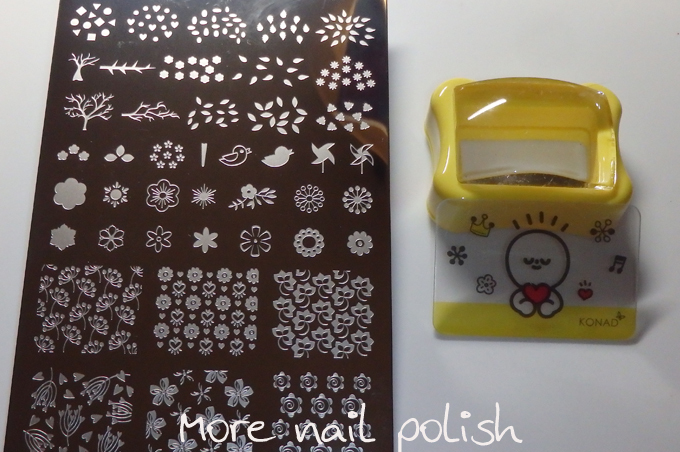 Also from the KONAD brand is the square clear squishy stamper. I'm thinking this square stamper might become my new favourite. I love that the base is very short, so you can see your finger very clearly without any distortion, and the stamper size is large. 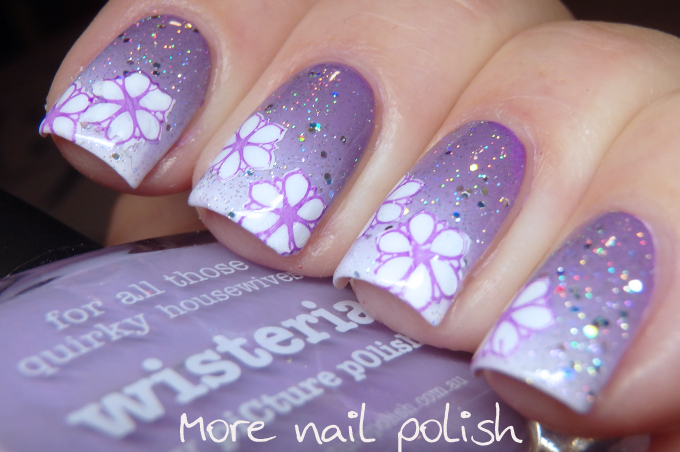 This would be perfect for girls with long nails. 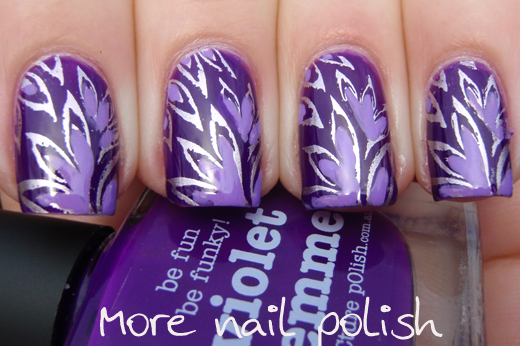 I found with some large images I was able to get two fingers out of one stamp, because my nails were able to fit sideways on this stamper. KONAD plate and stamper provide for consideration. Lovely! Your efforts to keep all the hues subdued really paid off nicely. And, the Konad plate & stamper look great, glad to know a place to get their products again.